Built as the site to worship the great Chinese thinker Confucius, the shrine known as Fuzi Miao in Chinese, has been the most bustling local cultural and commercial center since its establishment in 1034. Covering an area of 2.63 hectares with surrounding buildings in good harmony, it enjoys a typical architectural style from the Ming and Qing dynasties. 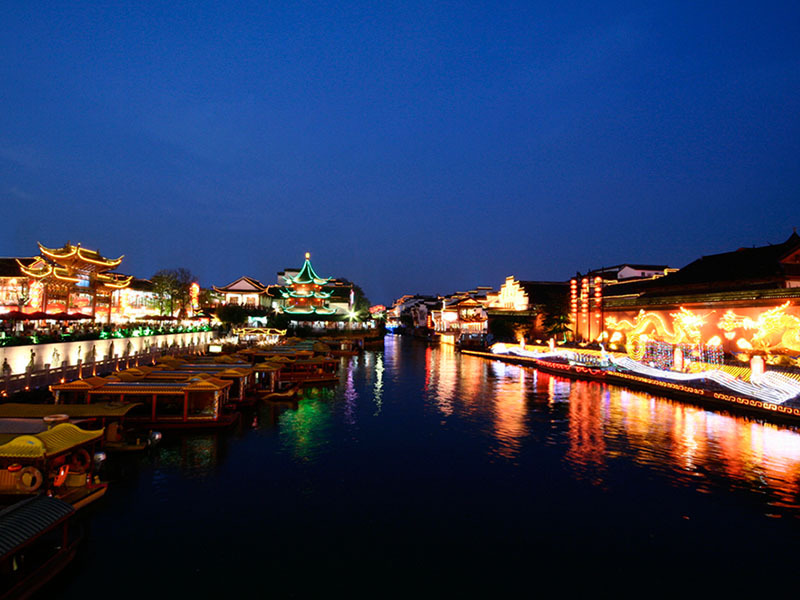 This China town in Nanjing is the first place to be for Chinese. You can see local restaurants always busy and full, hunt for folk souvenirs and obtain a real Chinese bargain experience. The night market is a great choice for an after-dinner walk. During Chinese New Year, a three-week lantern festival takes place here. Metro Line 1 Sanshanjie (三山街) Station Exit 4. Turn right, walk a few meters, turn right at Jinshajing Road (金沙井路), turn right at Zhonghua Road (中华路), turn left at Zhanyuan Road (瞻园路). You can find Zhanyuan Garden (p) first. Continue walking till the end of Zhanyuan Road. On your left, you can find a tablet written with ‘Fuzi Miao Pedestrian Street’. Total walking distance: 1000 meters.